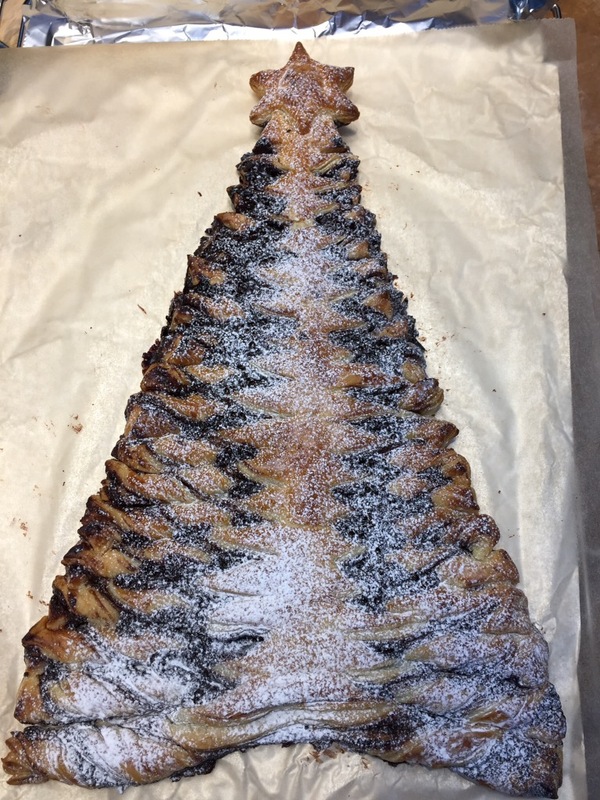 Spotted online recently was how to make a Christmas tree with Nutella and puff pastry. It looked amazing, so I thought I would try making one for the staff at The Beatson where I volunteer. I wasn’t sure about nut allergies so I sent Santa’s elf to Waitrose to get some of their dark chocolate spread to use instead of Nutella and, for the same reason, I didn’t use the chopped almonds either. I bought lovely all butter puff pastry from Tesco (ready rolled of course 😉) . I got up nice and early to make my Christmas tree so that it would have time to cool before I had to parcel it up. Simple. Nope. For a start my whole kitchen was like an oven (mild weather has arrived just in time for Christmas 🙄). 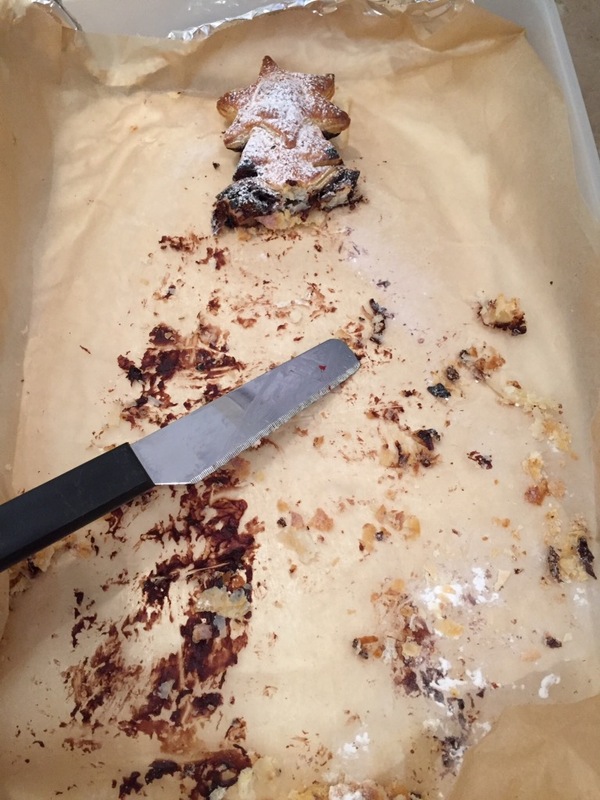 It was fine when I placed the pastry on the baking tray and spread on the chocolate but by the time I put the top sheet of pastry on, the pastry was very warm and I had to pop it back in the fridge for a few minutes. The next step involved making the cuts in the pastry and twisting it like you would when making breadsticks – my hot hands were covered in chocolate 😱! I got there in the end and baked my tree in the top oven of the Aga for 20 minutes but decided an extra five near the floor of the oven was necessary – no soggy bottoms in this house! A wee sprinkle of icing sugar on the top and I was ready to go! Everyone thought it looked amazing and so I thank whoever dreamed up this fantastic Christmas treat! Says it all really! It wasn’t really sweet which I like but I think the addition of chopped nuts might be good from a texture point of view. And just in case you thought the star got left, it didn’t. All gone by the time I went home which is just the way it should be. How fun…I’ve pinned it. I hope you had a wonderful Christmas Day.